Oh, never mind. Now I'm apparently actually at the holocabana. Saves walking, I suppose. I believe this is the first time I've actually shown a character walking since around comic #099. What game are they playing? The "A" with the pictogram of someone jumping over the wall looks like something out of Legend Of Zelda. Trope-tan: So, um, what was your Spot check from now? present!Jane: Yes, truly, this shall be the most awesome activity of all time! How unfortunate that anyone hiding in this room shall miss out on the awesome! Trope-tan: … are you sure you failed that roll? Because it sounds to me like you know we're in here and you're trying to lure us out. Jane: Oh, I did roll a natural one. … it's just that my Wisdom bonus is +30. present!Jane: Indeed! Those concealing themselves behind any chest-high walls in this room shall not be privy to these events, including the opportunity to pilot a series of giant robots! Jane: Holy crap we have to reveal ourselves. past!Trope-tan: Alas, that is a thing we must not do. Trope-tan: While piloting giant robots is awesome, it'll break causality. Also probably destroy the universe. present!Jane: The aforementioned giant robots are approximately the same size as the universe just referred to! In fact, the eponymous Tengen Toppa Gurren Lagann shall be making an appearance! 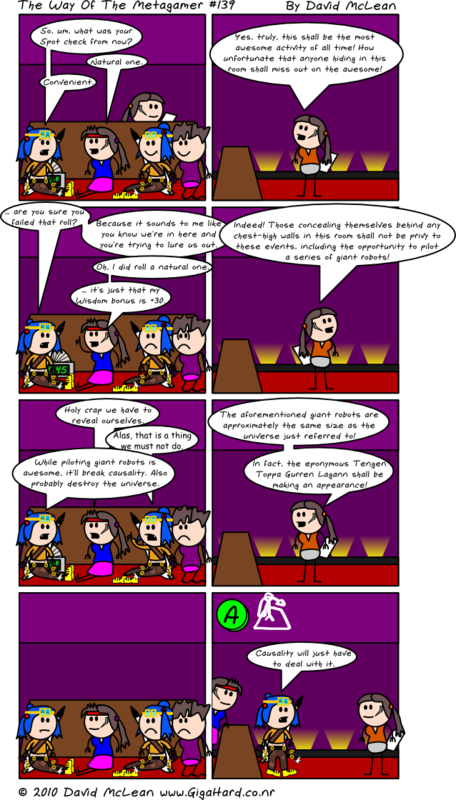 Trope-tan: Causality will just have to deal with it.